We tested the Yamaha YAS-106 (1), Samsung HW-K450 (2), Vizio SB3821-D6 (3), JBL Boost TV (4) and LG SH6 (5). Soundbars offer an affordable, better-sounding alternative to the built-in speakers on today’s ultra-thin TVs. The tiny speaker arrays in flat-panel displays simply aren’t capable of moving enough air to reliably deliver clear dialog, swelling music and explosive sound effects. To pick up the slack, connect a soundbar to your TV’s audio output to enjoy bigger, better speakers, more amplifier power and, in many cases, a subwoofer to convey deep bass. Decent soundbars that sound good not only with TV and movies but also with music used to be pricey. Today you can buy soundbars that easily satisfy the audio quality needs of most listeners for less than $250. They blow away the speakers built into most flat-panel TVs while also providing wireless features like Bluetooth and Google Cast so you can stream music, internet radio or podcasts from a smartphone or tablet. Most manufacturers provide iOS or Android apps to control the soundbar, so you don’t even have to rely on a regular remote. Since TVs can be expensive, especially ultra-high-definition TVs, we thought it best to set a price cap for our guide of $250. That’s probably the maximum most people want to spend on a soundbar after dropping a grand or more on a new set. Every model on our list has a subwoofer, either external or built into the bar itself. All the models listed have either an HDMI input or optical digital audio input to accept audio from a connected TV. They also all have wireless capabilities to allow app control and stream sound from apps like Spotify and TuneIn. 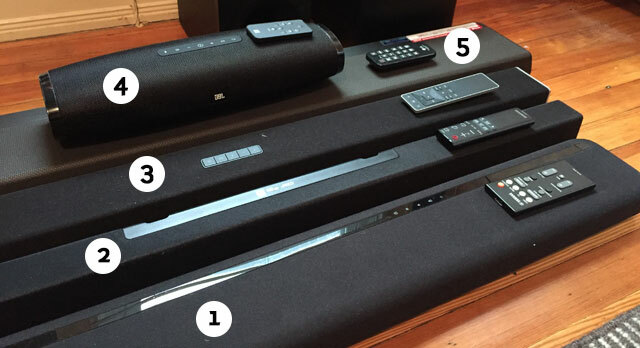 We looked at professional reviews for each product along with Amazon ratings to see how each soundbar fared among users out in the real world. After surveying the field, we reviewed five models that met these criteria and received accolades from end users and critics: the Vizio SB3821-D6 ($218 on Amazon), the Samsung HW-K450 ($228 on Amazon), the LG SH6 ($230 on Amazon), the JBL Boost TV ($200 on Amazon) and the Yamaha YAS-106 ($228 on Amazon). 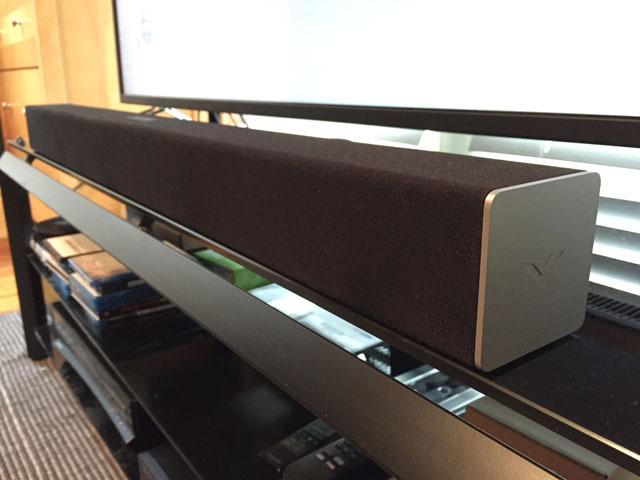 Of the five soundbars we tested, the Vizio delivered the best mix of features and performance. At $180, it’s an incredible value. The separate wireless subwoofer pairs automatically with the soundbar and shares the same slender, silver-capped design — a huge improvement over the look of earlier Vizio soundbars. The Vizio sounds great with both movies and streamed music. It has superior bass extension and is able to play the loudest of all the systems tested. With both Bluetooth and Google Cast onboard, the Vizio makes it easy to wirelessly stream music from apps like Spotify. While it lacks HDMI jacks, the Vizio provides plenty of other connection options, including coaxial and optical digital and USB ports. Vizio’s SmartCast app makes setup easy. Use it to create audio groups with other Google Cast-enabled speakers to provide multi-room music playback. To evaluate the soundbars, we spent time watching and listening to reference movie clips and music tracks. In each case, we connected the bar to the TV’s optical digital output, which in turn routed sound from a Blu-ray player used for disc playback and movie streaming. For music testing, we streamed uncompressed, CD-quality tracks from a computer over a wired network using the Blu-ray player as a DLNA client. We used the Tidal app to stream CD-quality music to the bars from a phone, though performance here was limited on the units that only provided a Bluetooth wireless connection, which applies lossy compression to streamed audio files. Since connecting a soundbar to your home’s Wi-Fi for app control is a big part of its setup, our evaluation also took into account how easy it was to step through that process. User-friendly features like front-panel LED displays and hardware remote controls also figured into the final assessment. The Vizio comes with everything you need to get up and running, including all the necessary audio cables for connecting to a TV, Blu-ray or DVD player and portable device. The package contains hardware brackets and a template for mounting the soundbar to a wall. Basic setup is simple. Press the pairing button on the back of the wireless subwoofer to make an instant connection with the soundbar. To pair it with the system via Bluetooth, press a button on the bar’s top surface; the Vizio will show up as a device on your phone’s Bluetooth settings screen. Vizio’s remote control is nothing special, but it does include all the necessary buttons to operate the system and enable its sound EQ and processing features. Those features include DTS TruSurround (a surround effect from the system’s stereo speakers) and DTS TruVolume (which maintains a consistent volume level when switching between TV channels and different sources). The Vizio SmartCast app offers a more efficient control method than dealing with the hardware remote and front-panel indicator LEDs, which provide more limited feedback than some of the other units tested. Launch the app to be guided through setup. All you need to do is position your phone or tablet near the soundbar, and it will automatically connect the Vizio to your home’s Wi-Fi network. Now you can easily switch inputs, sound EQ and processing settings, and you can stream audio directly from Google Cast-compatible apps, including Tidal, Spotify, Pandora, Google Play Music and TuneIn radio. The Vizio soundbar showed a clear advantage over the other models we tested in its ability to play loud without distortion. Watching the action movie Pacific Rim, the sound was dynamic, and we pushed the volume to near-uncomfortable levels before the Vizio revealed any strain. Bass was low-reaching, tight and well-integrated with the higher-frequency sound. Dialogue sounded consistently clear and wasn’t negatively impacted when we enabled TruSurround mode for an authentic sense of surround sound. Music sounded really good on the Vizio soundbar. Its full midrange presentation made vocals sound natural. Treble was crisp and for the most part clean, and the subwoofer’s potent performance lent bass guitars and drums plenty of kick. We heard a good degree of stereo separation, and the sound easily stretched beyond the confines of the bar. Since the Vizio is a new model that arrived in late 2016, we weren’t able to find any professional reviews of it online. User reviews have been almost uniformly positive, with the Vizio earning an average of 4.1 stars on Amazon. The Yamaha YAS-106 sells for the same amount as our top choice. It has a similarly compact design, but the Yamaha’s subwoofers are built into the soundbar enclosure for even greater compactness. The design allows for either wall mounting or flat placement on a TV stand. A series of LED indicator lights provide visual feedback when you control the soundbar using the included remote or Yamaha’s excellent HT Controller app. The Yamaha edges out the top-choice Vizio in the connectivity department, with HDMI input/output ports and HDMI Audio Return Channel (ARC) capability to draw sound directly from a compatible TV. The Yamaha’s RCA-jack subwoofer output lets you hook up an external subwoofer to get even better bass output. However, wireless audio connections are limited to Bluetooth, a technology that doesn’t provide the same sound quality potential as Google Cast, which can stream uncompressed audio. Other areas where the Yamaha came up short against the Vizio were bass extension and overall sound output. At moderate volumes, the YAS-106 sounded fine, with notably clear dialogue in movies and TV. When pushed beyond its limits, however, the Yamaha’s bass became lumpy and the sound took on a boxed-in quality. Still, if you’re looking for a compact, all-in-one solution, the Yamaha would make an excellent choice. 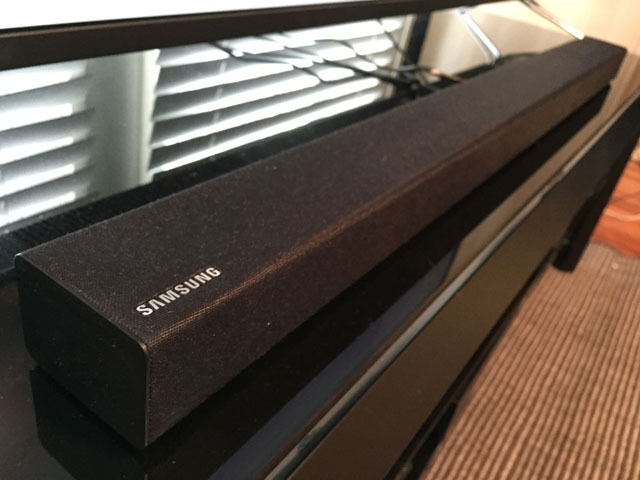 Another system with a compact, wireless subwoofer, the Samsung HW-K450, offers user-friendly features like Auto Power Link, which automatically turns on the soundbar when it detects an input signal. It has a good control app and a large, clear alphanumeric LED display on the front panel. Like the Yamaha, the Samsung provides good all-around performance, although its small subwoofer limits its overall output. There’s nothing really wrong with the Samsung; it just doesn’t perform as well as our top choice, which costs just $30 more. The priciest entrant in our roundup, the LG SH6 offers an impressive mix of features and sound quality. Like the Yamaha, it has built-in subwoofers and provides HDMI input/output ports with ARC support to complement its optical digital and analog inputs. It also offers both Google Cast and Bluetooth wireless streaming. During listening tests, the LG played loud music without strain, and the bass output delivered by its internal subs was impressive. What we didn’t love was its bulky size compared with the other bars. Setup using the LG app was problematic. We made several attempts before finally getting the app to add the speaker to the network. And while overall sound quality was good, treble could be a bit too crisp at high levels, a situation not helped by the Adaptive Sound Control EQ feature. Still, if you want an all-in-one system like the Yamaha that can play nearly as loudly as the Vizio, the SH6 is worth checking out. The Boost TV had the smallest footprint of all the models we tested. Despite its diminutive size, it plays reasonably loudly and manages to convey a good degree of surround-sound envelopment when its Harman Display Surround feature is enabled. What didn’t thrill us about the Boost TV was the toy-like remote control and its somewhat clunky and annoying setup process. Although it sounded good playing music, the stereo image was narrow and somewhat constrained. What type of listener would appreciate the Boost TV? Someone who wants the smallest soundbar possible and can accept the limitations that come with it. 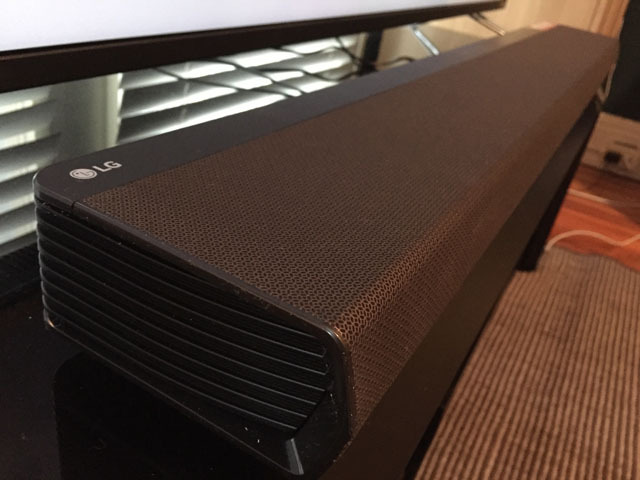 It’s amazing to think that a soundbar priced under $200 could fulfill the audio needs of an average-size home theater or living room and do so brilliantly. Just two years ago, we wouldn’t have thought it possible. But the Vizio SB3821-D6 has set a new soundbar price-performance benchmark. It delivers authoritative bass, a natural-sounding midrange and clean treble when playing music. Its TruSurround feature creates an impressive sense of surround envelopment with movies. While other models we tested offer other positives including a good mix of features and performance for the price, the Vizio is the standout of the group. So under $100 soundbars are junk? Not junk, just not the best. Many sub-$100 soundbars will sound better than your TV. 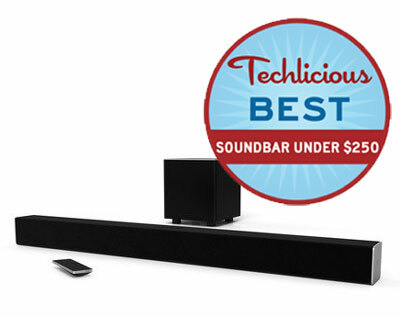 However, the soundbars above offer the best quality for under $250. And, in many cases, will sound far better than the sub-$100 models, especially if you plan to use the soundbar for playing music in addition to TV watching. In short, if you want something that is better than your TV, a sub-100 model may do that. If you want something that sounds significantly better than your TV for only a little more money, go with our pick above. Right timing to find one for my TV boxes. What Other sound systems did you rate? 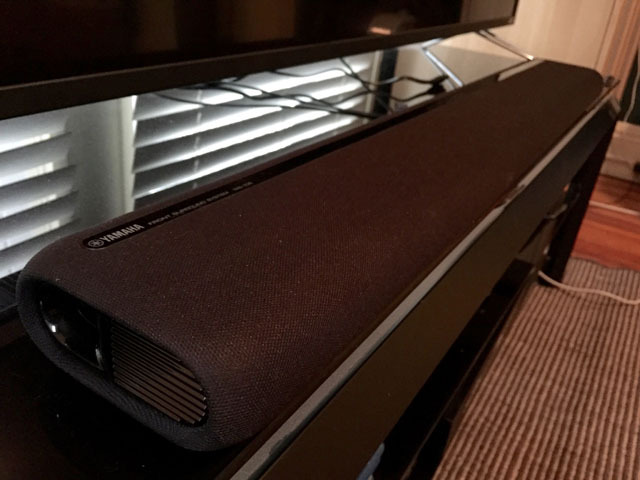 Other sound systems did you rate?I am interested to see if you tested and rated any Bose sound bars. 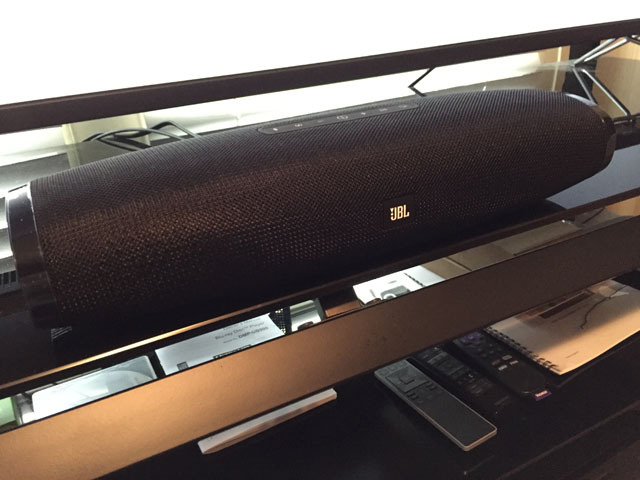 We didn’t include the Bose soundbar in our testing because it was above our $250 price point. We picked the best models available for our in-depth testing.